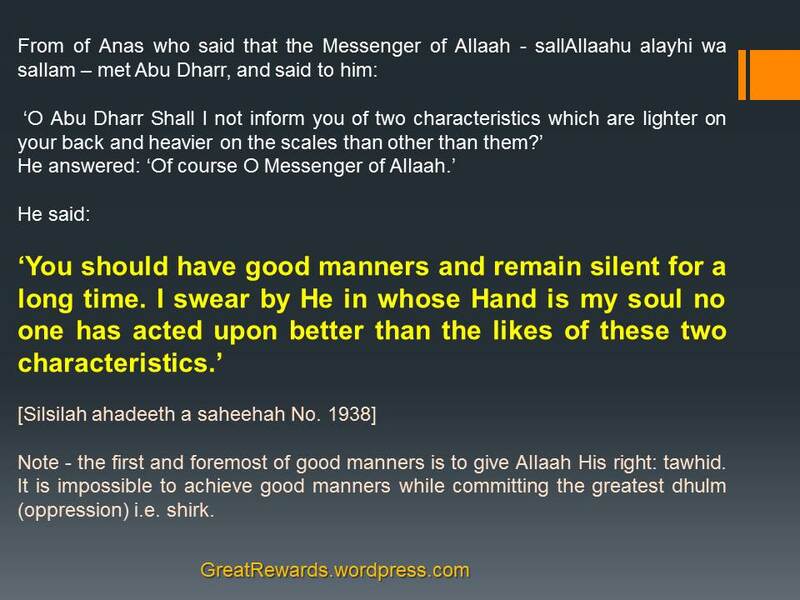 Note – the first and foremost of good manners is to give Allaah His right: tawhid. It is impossible to achieve good manners while committing the greatest dhulm (oppression) i.e. shirk. Translated by Abbas Abu Yahya . 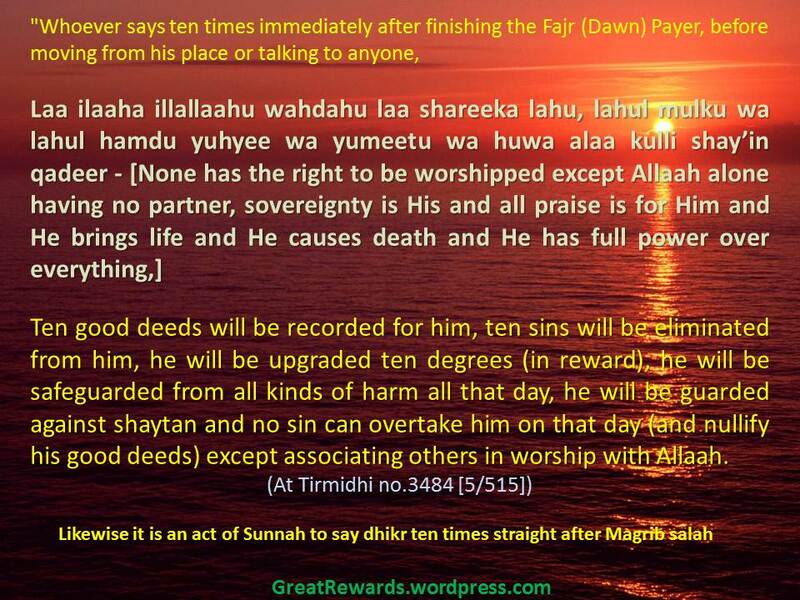 Rewards for Dhikr Chart – Excellent One !! Whoever says ten times immediately after finishing the Fajr/Maghrib Prayer ..
At-Tirmidhi commented on this hadeeth saying, “This is a hasan, saheeh hadeeth (i.e a good and authentic hadeeth)”. Likewise it is an act of Sunnah to say dhikr ten times straight after Magrib salah too, according to a hadith related by Imaam Ahmad Hanbal (rahimahullah) on the authority of Umm Salamah (radiAllahu anha), hadith number 26430. 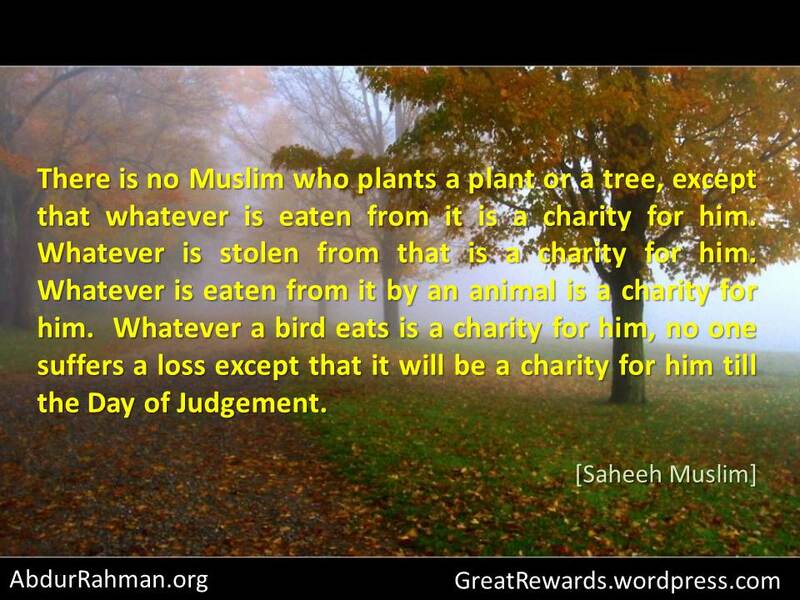 Also stated in Sahih Ibn Hibban no. 2023. Shaikh al-Albaanee (rahimahullaah) said this hadeeth is (saheeh) authentic. O Allaah, whatever blessing has been received by me or anyone of Your Creation is from You alone, You have no partner. All praise is for you and thanks is to You. Whoever recites this in the morning, has completed his obligation to thank Allaah for that day; and whoever says it in the evening, has completed his obligation for that night. Abu Dawood 4/318, An-Nasaai ‘Amalul-Yawm wal-Laylah (no.7), Ibn As-Sunni (no.41), Ibn Hibban no.2361). Its chain of transmission is good (Hasan), Ibn Baaz, p.24.